Comme des Garçons is the coolest fashion house on the planet. Founder Rei Kawakubo is a designer that plays with the form, shaping it into something surprising and new that challenges one’s preconceived notions of what fashion can be. The fragrance arm of Comme des Garçons operates with the same set of principles, showcasing a line of perfumes that confront one’s ideas of how perfumes can smell and resets these expectations completely. With their fragrances, they often present subversive takes on familiar themes – take Amazingreen for example, a scent that juxtaposes the sweet and mineral facets of green against each other, creating an odour profile that is far from the dry green grasses one is used to. Comme des Garçons are a pioneering outfit for rebellious fashion and fragrance. 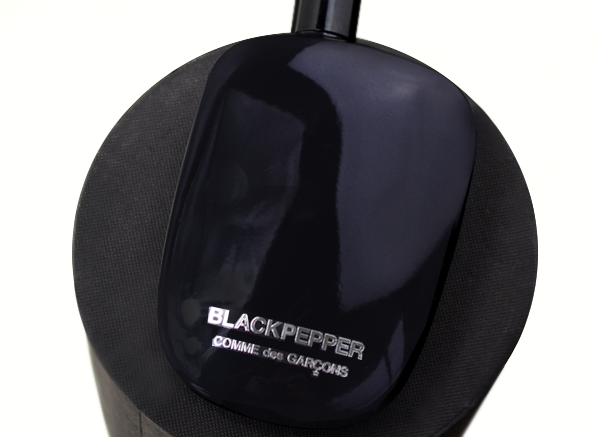 The latest addition to the Comme des Garçons lineup is Blackpepper, a scent that you will be surprised to learn centres on a note of Madagascan Pepper. Comme des Garçons call it a “powerful fusion of molecules that collide and harmonise”, describing a fragrance with an electric spirit that seeks to awaken and overwhelm the senses. Blackpepper is an experience of a fragrance – one to overdose on, so buckle up and enjoy the intense whoosh that it releases. It’s a new form of scent entirely, one that straddles the line between literal translations of real-life odours and abstract presentations of olfactory form. Blackpepper is a tightrope walk. First things first, I’m a black pepper freak, I have it on everything and I mean EVERYTHING. Soup, roast dinners, poached eggs and strawberries (don’t judge me, you’ve not lived until you’ve tried black pepper on strawberries, trust me), you name it and I’m likely to have showered it with black pepper and eaten it at some point in my life. I like pepper in my scents too, especially with the likes of Marc Jacobs BANG and MiuMiu by MiuMiu, so I must admit that I was super excited to try a Comme des Garçons take on one of my biggest addictions, and I can tell you now that I was not disappointed. Blackpepper opens all lively and fresh, just like a healthy twist of pepper freshly ground from the mill. Initially, the pepper is sharp, crackly and metallic, almost evocative of a glistening stream of silver tinsel, but it’s never too much of these things and right from the outset, one gets the impression that the balance of all the elements within the composition are perfectly in check. In parallel with this, there’s a tiny hint of citrus, perhaps some bergamot, that adds a refreshing quality and an even smaller hint of aldehyde (a micro-aldehyde if you will) that brings a smoky, savoury character that somehow rounds things off quite nicely. In a surprise turn of events, Blackpepper unveils a distinctly floral heart after about half-an-hour of wear. Of course, this is a Comme des Garçons fragrance so to expect photorealism is like asking for an ABBA song that isn’t catchy – it’s just not gonna happen, so the flowers here are imaginary. To my nose, I get the sense of flowers made from stone – blooms crafted carefully out of rough concrete, with a delicate hand, yes, but also in a manner that celebrates the imperfect edges of the materials. As it dries down, Blackpepper softens considerably and surprises with a vanilla note that warms the whole thing up to a level that can only be described as ‘sensual’. What’s interesting in the dry down, is the fact that it boasts the plush, velvety texture of vanilla (which somehow brings a subtle powdery feel) without any of the sweetness of the material. In fact, there’s a fascinating, savoury feel to the scent as it wraps up, that makes for a truly fascinating wear. I’m just going to come right out and say it: Blackpepper is beautiful. It is heartstoppingly, nose tinglingly awesome. Sure, there are other notable black pepper fragrances out there, but Comme des Garçons have managed to create one that has incredible tenacity but also wonderfully smooth edges that prevent it from falling into the trap of being overtly harsh and metallic, as so many pepper scents do. I think I’m going to even go as far as saying that this is my favourite thing I’ve reviewed for Escentual all year. Yup, that sounds about right and if that’s not an endorsement then I don’t know what is! This entry was posted on Wednesday, November 23rd, 2016 at 12:00 pm and is filed under Candy Perfume Boy, Fragrance. You can follow any responses to this entry through the RSS 2.0 feed. You can skip to the end and leave a response. Pinging is currently not allowed. I’ve been wearing this off and on for a month. It’s unreal. In regards to tenacity, I am a professional photographer and wore it on a shoot. A week later after unpacking my camera to put on the studio stand, I couldn’t figure out why I was getting notes of the fragrance (that lovely dry down you mention) and leaned into my camera to realize it was that which smelled so good. Talk about lovely and long lasting! Oh wow, that is tenacious! I completely agree. Black pepper scents tend to be very light to its remarkable that this one hangs on so long. I’m obsessed!